“YOU’VE 6 More Months to find Maddie.” You. (Me?!) Yes, you. 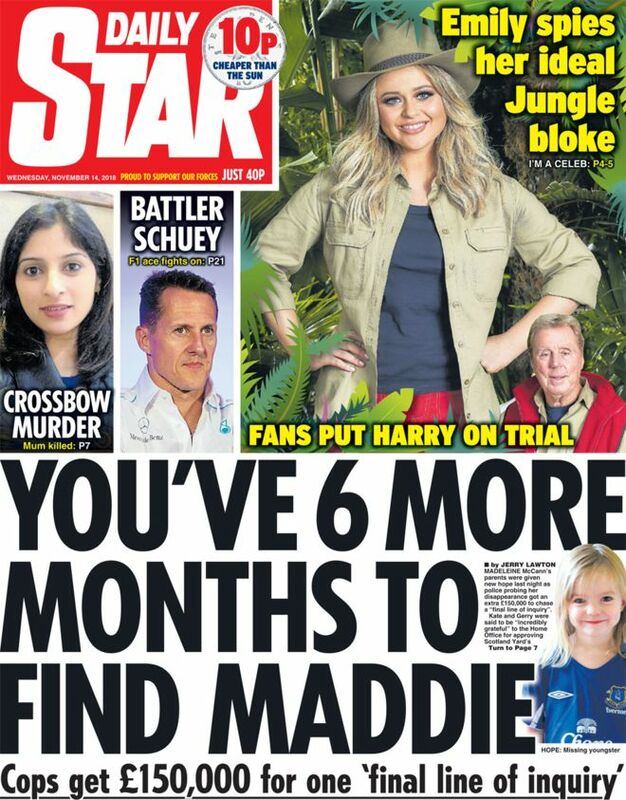 You might qualify for the huge reward the News of The World posted for information leading to the return of the papers’ ‘Our Maddie’. But that money most likely vanished when the paper was spiked. Of course, its not really about you. The Star’s headline, which you’ve just read, refers to the police working on Operation Grange, the investigation into the child’s disappearance in May 2007. The front-page news is that coppers have been given a further £150,000 to “chase a final line of enquiry’. Wondering what this final line might be, we race to page 7. We hear from the McCanns’ spokesman Clarence Mitchell. He says Kate and Gerry McCann, the girl’s parents, are “very encouraged that the Met Police still believe there is work left to be done in there each for the daughter.” Ergo: the police have yet to find her or what happened to her. We’re told Operation Grange has “cost taxpayers £11.75m”. And a Home Office spokesman says money will fund the investigation until March 31 2019. Things are “ongoing”. But there not word on what the “final line of enquiry” is. As for the other tabloids which once featured Madeleine McCann on their front pages, the Sun shows her only on page 8. In a slim, short column punctuated by an advert for an M&S meal deal and news that Goldie Hawn, the actress, is still blonde at 72, we get the figures and news of that “final line of enquiry”. The Express (Page 10) adds news that police have been “secretly visiting Portugal in the past year”. But it’s not a secret is it. Its entirely expected. And in the Mail, nothing. Madeleine McCann is missing. And that is the only thing we know.